YOUR GO-TO GUIDE FOR DORM ROOM DOs and DON’Ts. BED SET – One of the most important things you will need in your dorm is a nice set bed set. 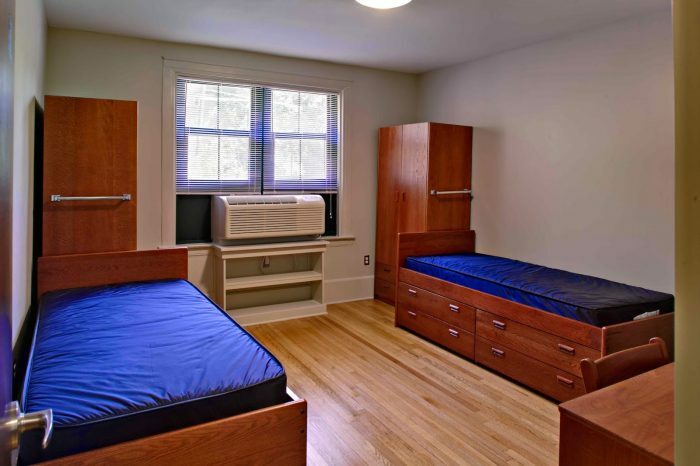 Your bed will be the place where you will spend most of your time studying and doing work in college, and dorm beds can be hard and unforgiving. You can always get a mattress pad to soften things up in addition to a nice, comfy set. MINI FRIDGE – Every student will need one. Whether you know how to cook or not, you will need this to store your drinks and leftovers. It can also make your dorm feel a little more at home. It doesn’t have to be expensive, but it’s worth consideration, especially given the number of snacks you will potentially enjoy while cramming work in. TOTE – In order to keep a clean environment between you and your roommate, a tote will come in handy. It can help keep all your personal hygiene product together without mixing them with your roommates’. It will also keep you from annoying your roommate with dirty items. MICROWAVE – This is to heat up your leftovers for the most part. What college student will not have leftovers over a long period of time? It’ll help you enjoy late night leftovers, popcorn, and meals for your comfort. ROOMMATE AGREEMENT – If you and your roommate sleep at different schedules, it’s best to make suggestions for each other so you can bear living with them. Make rules with each other, and tell each other your pet peeves. It helps with your friendship if you maintain an openness with them, and it may help resolve future conflicts. NEVER PAY FULL PRICE – There are coupons for students everywhere. You can shop at places like Target or Bed, Bath, and Beyond to get good, cheap stuff made with quality. You will save your money by shopping for less. FIRST AID KIT – If you’re someone who takes a lot of medication, this will be helpful. Also, in cases of emergency, it’s good to be the one who’s prepared with antiseptic, band aids, and other necessary items. Make sure your kit is fully stocked! TOWELS – This is self-explanatory, but keeping a few towels will definitely be a necessity for when you shower. Remember that dirty towels will begin to smell, so you should stock up so you never run out or have to use a funky one to dry yourself. KEURIG COFFEE MAKER – If you’re a coffee lover, this will definitely save you money. It also saves you the time of running to Starbucks or a local coffee shop, especially when you are pulling a lot of all-nighters. LAUNDRY BASKET – Instead of putting all of your laundries into a big pile, it’ll be more helpful to keep it into a basket. This helps you stay organized and prevents you from making your place smell. 濫 It will also motivate you to do your laundry more often. GROCERIES – This helps with your mini fridge. It is not healthy to constantly be eating out. In order to save more money, making your own meals will be convenient. Also, you won’t have to get bored with your dining hall food and get to make anything you desire. SEVERAL PILLOWS – Since you’re staying in your bed for the majority of the time to study during late nights, multiple pillows will help you find comfort. It will also help you sleep better when you are under pressure and stressed. ELECTRONICS – Students now are more on social media than ever. In order to keep track of the latest activities and assignments, a laptop is crucial. This will also help you get your work done more effectively and in a timely manner.